Help your child learn how to solve word problems and have fun at the same time with this complete story line. Amber Waves appears in Dectective Justin Time's office one day, declaring that her "poor, petunia-pickin' prize pig, Polly Esther, has been porknapped!" …and she'd like his help to find her. It appears that the dreaded Word Puzzler has captured her and left a series of word problems through which Detective Time and Amber Waves will have to work in order to earn clues to the whereabouts of Polly Esther. As our two heroes progress through the case, the word problems get trickier, but luckily, our heroes get smarter (or maybe just more confident?). Will Detective Time and Amber Waves solve all of the problems in the end? Will they ever learn the whereabouts of Polly Esther? Guess you'll have to watch to find out. Buy now from Rainbow Resource or Sonlight. 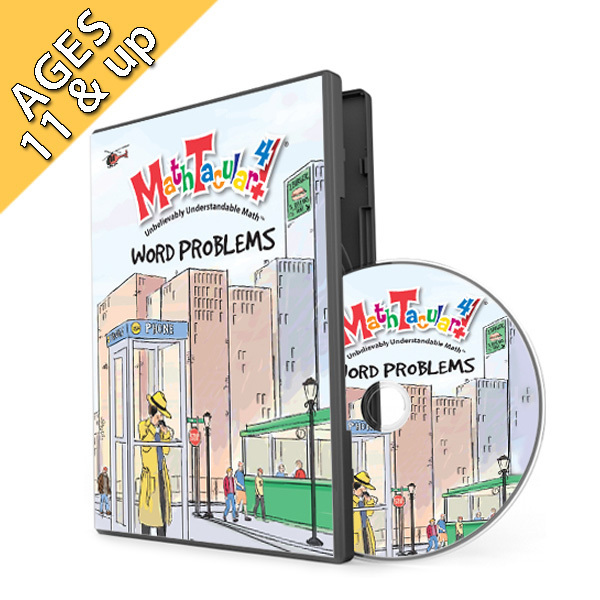 The Math Word Problems DVD is designed to either play straight through for those that want to watch the DVD like a movie or it can be set to automatically stop after each sample problem to give kids the opportunity to try to solve it on thier own. Once kids have tried their best, they can select Continue and we'll work through the problem with them on the DVD. At the end of the scene, Justin encourages the kids to try the following similar problems in their workbook, and then the DVD takes them back to the Scene Selection menu. This hilarious adventure gives your children the tools to face pesky word problems with confidence. Unique among the popular MathTacular series, MathTacular 4 covers a very wide scope of mathematical skills as it focuses on one goal: how to solve word problems with confidence. The problems start with simple addition and continue to more advanced problems with fraction and algebra. And even if your kids aren't ready for the more advanced skills (like fractions and algebra) at the end of the video, they'll love watching Amber Waves and Justin Time chase the case to the end. 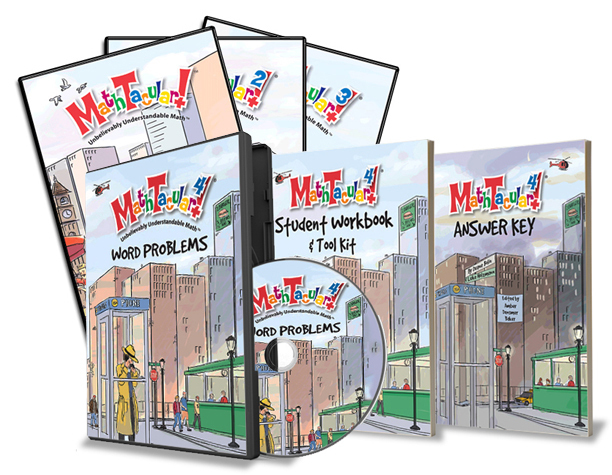 If you choose to get the whole MathTacular 4 Package, your kids can solve each word problem along with the video. Extra practice problems solidify each concept they learn. Buy the MathTacular4: Word Problems package from Rainbow Resource or Sonlight. This set with the DVD, Workbook, and Answer Key is great for grades 6 and up. If you'd prefer the DVD by itself, you can buy it now from BookShark, CBD, Rainbow Resource, or Sonlight. The DVD alone is great for grades 4 and up. Finally, with MathTacular 4, word problems are fun, practical ... and unbelievably understandable! 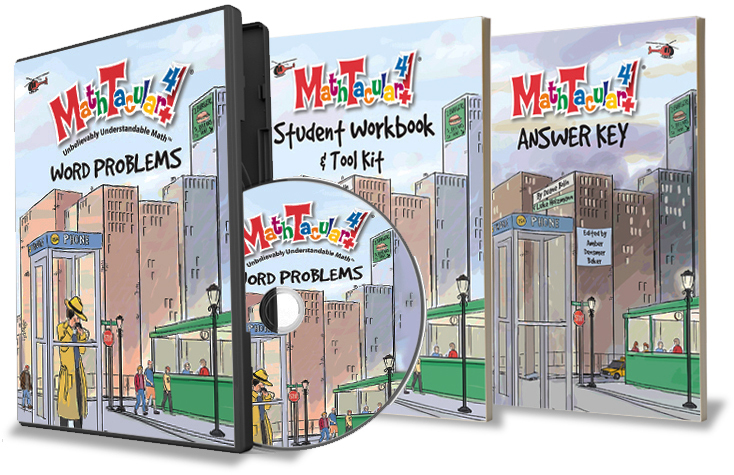 Add the MathTacular4 DVD and Workbooks to master even word problems in addition to everything else. Take what you've learned in MathTacular 1-3 and now test your skills against the Word Puzzler, a devious foe bent on making math confusing. But never fear! With the help of Detective Justin Time and Amber Waves, your students will confidently ferret out the answers and laugh while doing so. Buy now from BookShark, Rainbow Resource, or Sonlight.